The DC Comics "Rebirth" party train continues to chug along this week and by design, it's slowed to a crawl to let new riders get on board and Detective Comics is more than accommodating. Literally going back to its roots by using the old numbering system making this issue #934, writer James Tynion IV presents a straightforward easy-to-digest rally the Bat-family story that introduces a dynamic new team of fan favorites. Batman senses a new technologically savvy threat emerge and decides the young heroes of Gotham need some training to prepare for whatever is to come. He enlists the help of Batwoman to train and recruit them and what follows is pretty standard introductions of selected heroes. It would all seem blasé were it not executed so well and who these characters are. Tim Drake as Red Robin is a welcomed but not surprising addition to the team. The Catwoman-trained daughter of Cluemaster, Stephanie Brown a.k.a. Spoiler and Cassandra Cain as Orphan are a great duo of fan favorites. Probably the most unexpected choice is Clayface. Normally a dangerous villain, Tynion decides to make the former actor Basil Karlo turned monstrosity a sympathetic figure capable of redemption. It's a nice twist for the usual team made up of Bat-friends. One aspect that is important about this Bat-collective was that Kate Kane as Batwoman demanded to be Batman's equal on this new venture. Her value isn't to be discounted simply because she agreed to train the greener heroes. Batman has enough respect for her to see her worth. Batwoman deserves the spotlight and luckily so does Tynion. Eddy Barrows, Eber Ferreira, and Adriano Lucas do an incredible job on the art creating a dizzying display of action and scope with precision and creativity. The layouts are so dynamic that the perspectives continually change keeping the eye moving and the heart racing. Gotham is predictably dark and ominous thanks to Barrows' cityscapes and Ferreira's shadows but Lucas livens up the scenery with bold colors and clever lighting. It all comes together in the recruiting scene of Clayface, alone in an emptied theater watching an old film of his. 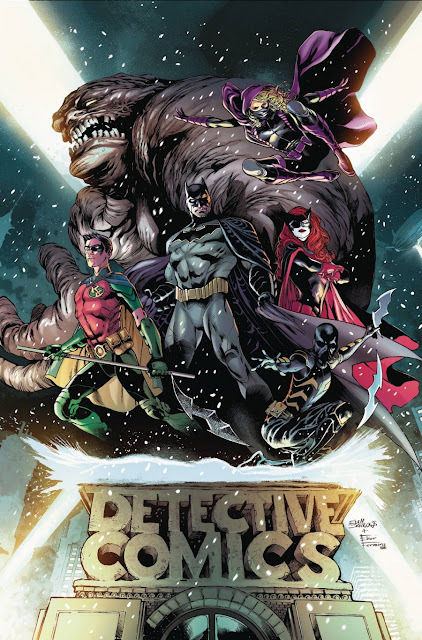 The more I thought about the plot details and the skill of the artists in bringing 'Detective Comics' into the post-New 52 era, the more I appreciated the result. Despite the well-worn team recruiting story the characters sell the book. If you would've told me a year ago I'd see Batwoman, Stephanie Brown, and Cassandra Cain fighting together in a Bat-book I'd call you delusional. It really happened and it's off to a good start and in the right creative hands.